Stuffed Animal (Hansa): Grizzly Life Size 78'' (4042). Hansa Life Size animals are hand-crafted collection of realistic plush animals. Artists working in a socially responsible and environmentally responsible studio create each Hansa animal from portraits of the creature in its natural habitat. When you hold these wonderfully "life-like" animals, you will see and feel HANSA's emphasis on quality, which is a result of careful attention to design, custom fabric selection, cutting, sewing, stuffing, eye placement, feature creation, framing, air brushing and finishing. Since each animal is hand sewn, there will be slight variations in appearance. 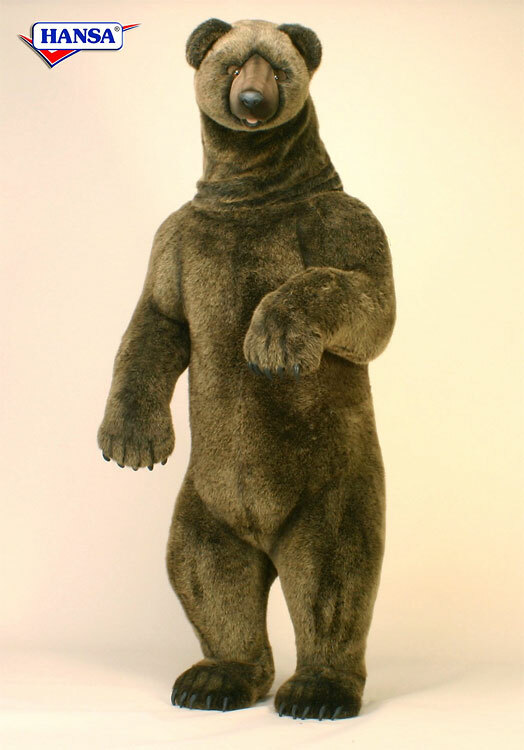 Hansa stuffed animal are hand sewn "inside out", an old world tradition that results in the mininization of seams, and their bodies are carefully "sculpted" to create "musculature" and "features" like movement in a walking or sitting position that are unique to each creature. On average, there are 42 separate pieces required to make each animal, that must be combined by a team of truly creative artists to create the distinctly realistic features that characterize HANSA animals. Some animals have as many as 240 different parts! Each animal is individually hand sewn, to give it a unique "personality", there are more than 860 different fabrics and man-made furs from which the "coat" and "hides" are made, along with over 6000 sets of different eyes, whiskers, claws, noses, and related accessories allocated for creating these wonderful plush animals. Feature: 1. Included teaching tag with information regarding animal's habitat, lifestyle, habits and more. 2. Completely hand sculpted with a unique personality. 3. Custom designed fabrics and man-made furs with realistic eyes, whiskers, claws and noses. Measurements: Weight: 52.91 lb. Size: Length 35.43 inches, width 29.53 inches, height 74.80 inches.